BUCHAREST - NATO leaders have agreed to fully endorse US plans to build a missile defense system in Eastern Europe and to urge Russia to drop its objections to the shield, senior American officials said Thursday. The endorsement is contained in a communique that the leaders of the 26-nation military alliance will adopt Thursday during their summit being held here, the officials said, speaking on condition of anonymity ahead of the statement's release. The document will state that "ballistic missile proliferation poses an increasing threat to allied forces, territory and populations." It will also recognize "the substantial contribution to the protection of allies ... to be provided by the US-led system," the officials said. The statement calls on all NATO members to explore ways in which the planned US project, to be based in Poland and the Czech Republic, can be linked with future missile shields elsewhere. It says leaders should come up with recommendations to be considered at their next meeting in 2009, the officials said. 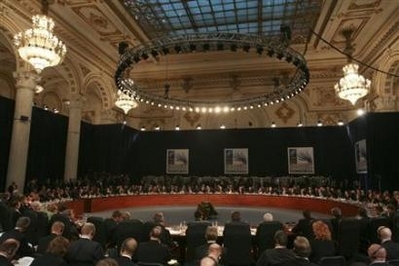 The document calls on Russia to accept US and NATO offers to cooperate on the system, the officials said. Russia vehemently opposes the plan, believing it will threaten its own deterrent force and upset the balance of power in Europe. The backing from NATO provides US President George W. Bush with a leg-up in his negotiations with Moscow over the issue.